Emily is one of our parent bloggers, sharing real-life stories from parents whose children are learning to swim with Swim England Awards. 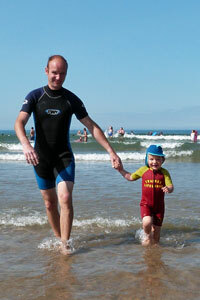 Find out how two-year old Seb has been building water confidence at the beach. What is better on a warm summer’s day than heading to the beach? Pre-baby, my husband and I would spend our summer weekends camping, surfing and sun bathing on the North Devon beaches. Fast-forward three years and our beach trips are somewhat different. We still try to do everything we did before because this small person will not defeat us! (if you repeat it, you start to believe it. I promise). But let’s face it, no matter how good our Instagram photos look, it is not easy. Firstly be prepared because babies can be terrified of the sea! Actually when you think about it, it is dangerous and I am not sure why we aren’t all much more cautious. My son Seb screamed when we first took him down to the shoreline and I panicked. This wasn’t my plan! Seb was meant to be surfing by the age of two (I warned you in my last post that I was a little naive). But we have persevered. The most important thing we have done is to stick with our adult and child swimming lessons. Every Sunday we battle the swim nappy and get splashing. We have flipped and we have flopped (a great technique moving your child from their front to their back in the water) consistently for two years and we have created a water baby. Not only is Seb confident around water but he is cautious too. He understands the dangers of being out of his depth. If our children don’t experience deep water safely, how are they ever going to know it is dangerous? The Swim England Discovery Duckling Award Scheme that we have followed has focused on building water confidence and water safety. It has ensured that Seb is comfortable being submerged and having water over his face which is great if he accidentally falls over in the sea! Not a tear in sight, phew. It has also taught him to get from a horizontal position in the water to safely standing up which has been useful this year when Seb has fallen off the surfboard (see I am making progress towards the surfing). Most importantly, it has taught Seb how to move and behave in water so that he understands what can happen and is prepared for it. So it is safe to say that we are very much enjoying the great British summer by the beach. This year we have surfed, kayaked, rock pooled and run from the waves as the tide has rolled in. I don’t want it to sound too idyllic. We have nearly had to re-mortgage the house to afford the ice creams. And there is sand everywhere! But I feel safe when Seb is around water and that is important to me. I am truly excited to see what skills another year in lessons will bring and what more adventures we will have on the beaches in 2018. To keep up to date with our adventures you can follow me on Instagram @mummyfish83. Whilst we will soon be packing away the beach gear, autumn brings an exciting development for Seb. He will be making the leap from adult and child to preschool lessons. I will be back to let you know how it goes.